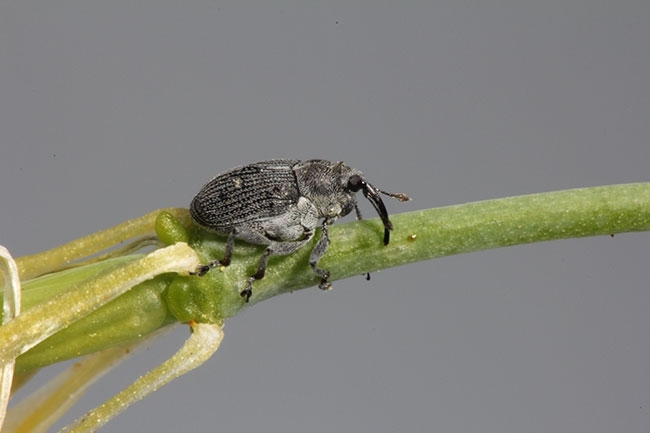 Cabbage seedpod weevil was first found in canola crops in southern Alberta in 1995, and has since spread to central Alberta, much of Saskatchewan and recently reached Manitoba. 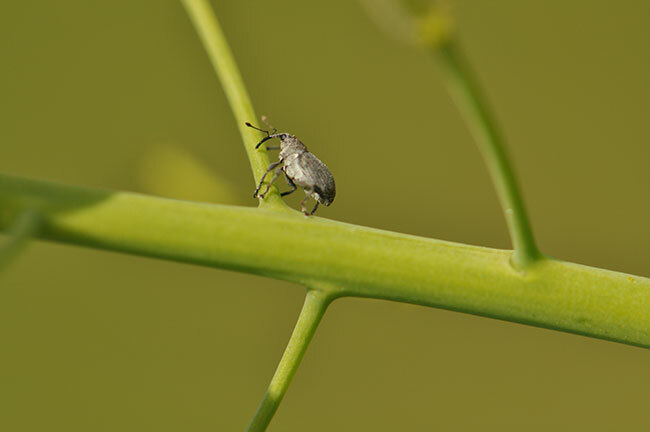 Originally, a nominal threshold level canola growers were advised to spray was three to six weevils per one 180-degree sweep at the early flower stage based on experience from Washington State. This was later revised to three to four per sweep, and then modified again to 20 weevils per 10 sweeps (two per sweep). Now, new research and a change in philosophy on economic thresholds have the nominal economic threshold set at 25 to 40 weevils per 10 sweeps. The economic injury level is the break-even point where the economic yield loss equals the cost of insecticide application. The nominal economic threshold can be different based on a number of factors such as changing canola prices, crop staging, how quickly an insect can cause damage to the crop and the impact of beneficial predators on the insect. Keith Gabert, Canola Council of Canada agronomy specialist for south-central Alberta, says the new threshold provides greater flexibility for canola growers when making a spray decision. seeded April canola fields were most at risk from weevil damage and benefited from insecticide control but only when the nominal economic threshold level was reached. Fields seeded later into early-to-mid May were less susceptible to weevil infestation. These fields were found to reach economic thresholds when cool spring conditions delayed weevil spring activity or if seeding was generally delayed in the area. Late seeded fields after mid-May seldom required weevil management. A revised threshold of 25 to 40 weevils per 10 sweeps has been established. The range also better accommodates a grower’s tolerance to insect damage, as well as their preference to encourage beneficial predators and protect pollinators. Cárcamo says he knows some growers like to encourage beneficials and hold off spraying until three or four times the threshold. “In most fields by mid-July this summer we were finding fairly high numbers of a parasitic black wasp. That’s another reason not to spray or to use the higher range of the threshold,” Cárcamo says. Another aspect of Cárcamo’s research was to look at how spraying for cabbage seedpod weevil impacted later season Lygus bug infestations. He found that lygus bugs were generally not a problem on early seeded canola fields, usually only posing a risk on canola fields planted in May. As a result, he did not see a benefit in lygus bug control at early flower when spraying early seeded canola fields when weevils were below threshold. sample 10 locations within a field, but was found to be too onerous. Often, this resulted in fewer sweeps being conducted, usually along the field edges were weevils could be more abundant, resulting in higher counts and unnecessary spraying. Cárcamo found that a good assessment of weevil numbers could be obtained with four samples per field. Scout at 10 to 20 per cent flower. Do one set of 10 walking sweeps (180 degrees) at the field edge and another set 50 metres into the field. Repeat the two sets at the opposite end of the field. Gabert says the revised sweep net protocol makes it easier for farmers and agronomists to sample properly. If a grower decides to spray, insecticide application should target the adults at the 10 to 20 per cent flower stage to prevent the adults from laying eggs in the developing pods. This is the stage when 70 per cent of the plants have at least three to 10 open flowers and the first pods are large enough to accommodate egg laying at about an inch in length. This is usually about one week after the first flower is seen in the field. Additionally, if there is no pod development, hold off on spraying because there aren’t any pods for the weevil to lay eggs.